10mm Franco-Prussian War castings from Pendraken. But I have still been painting a bit. 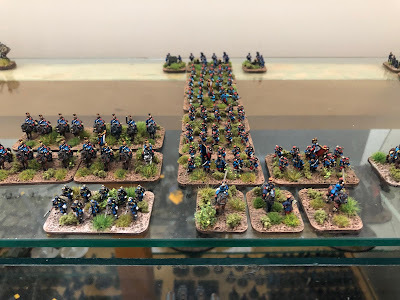 The period and setting will be a familiar one - the Franco-Prussian War of 1870, but I have switched scales for a bit, adding a few more 10mm figures. These castings are all from Pendraken. They add to some "test" figures I painted last year, and to some more I painted during the recent Analogue Hobbies Painting Challenge. These 10mm figures are being based with the game "1870" in mind. In the basic version of this game, one base equals one battalion of infantry, two squadrons or cavalry or a battery of guns. This scale allows for some of the very large engagements from the Franco-Prussian War to be played out on a gaming table of a somewhat reasonable size in a somewhat reasonable time. There are a few different elements in this post - up first is a regiment of Tirailleurs Algerian, the feared "Turcos", colonial troops from Algeria in French service. The Turcos were fine soldiers and performed bravely during the war. The three bases together would comprise the whole regiment. The Turcos are ready to march in defence of the Second Empire! Incredible detail and quality on such small figures - Pendraken sculpts are incredible, and really do justice to these iconic troops! These same sculpts can be used to represent Zouaves...I'll paint some of those up soon. Up next is some cavalry - French Dragoons. These two bases together would comprise an entire regiment of Dragoons. French Dragoon regiment in line. French Dragoon regiment in column. Then we move on to artillery - there are three batteries of French "4-pounders". These were rifled muzzle-loading pieces and two batteries of these guns were attached to each division in the Imperial army. These 4-lb artillery pieces were the main components of a French divsion's artillery strength. Then we have that exotic French weapon from 1870, the Mitrailleuse. Generally speaking, each French division in the Imperial army had one battery available. Finally some small stands to represent command - there is a French base and a Prussian one. How dumb is it to paint one setting in multiple scales? Certainly this causes a diffusion of overall progress toward goals...and this is true - when you spread your efforts out, you make a smaller percentage of progress towards a larger number of goals...no doubt this approach helps fill my basement with unpainted stuff, right? But there are many other positive things I find from collecting and painting a period or setting in different scales. First, there are some big battles from this setting I would like to game with the guys - but that won't happen in 28mm. I love and enjoy my 28mm collection, and will continue to add to it, but this will almost always be used to play smaller components of larger battles. Most of the main engagements in the Franco-Prussian War featured at least one Corps-level formation per side. At a battalion level, a French division alone would have 13 battalions of infantry. With 24-figure battalions, that's 312 figures just for the one division...a French Corps would have had three divisions, plus a cavalry division, and then the attached artillery...and that doesn't even count the Prussians! And even if I could somehow summon the time and skill to paint all of those figures in 28mm (hey, that would be cool, if miraculous), I'm not sure I could find a table or the space to represent, say, the battle of Spicheren or Mars-La-Tour...those would have to be enormous tables, so far beyond my skills to create, or the size of my house to hold! A Prussian division in 10mm for "1870" - two brigades of infantry (each of two regiments), a regiment of Dragoons (cut off on the left of the photo). The divisional artillery at the back. Command stands are at the front, along with a battalion of Jagers (cut off at the front left of the photo). So diving into smaller scales is the answer. But there is a further benefit...I find it refreshes my interest and motivation (oddly), to paint a period/setting in different scales. While I'm painting my 28mm figures, I'm saying to myself "oh man, this takes time, it would be so cool to just get a whole regiment painted in a few hours". So I crack out the 10mm figures, and boom! But then, while painting the 10mm figures, I'm saying to myself "oh man, these uniforms are SO awesome, I would love to see them in 28mm", so when I finished a stretch of 28mm, well, boom! I'm fired up for the larger figures again! An Imperial French division taking shape...one brigade of infantry is now complete, along with artillery and the attached Chasseurs a Pied battalion (they are at the front, lower left). Needs five more infantry battalions to complete the second infantry brigade. The cavalry, meanwhile, is the start of its own division...needs some lancers and Hussars to round out...always more, right? I decided to post all my completed units thus far for my Imperial Militia army, The Inferaltii Hussars. They served the Emperor during the Unification Wars, Great Crusade and Horus Heresy. I've used infantry from Anvil Industry and vehicles from GW. I've also scavenged vehicles from other sources which are offered at a slightly better price point! Some of these units were completed during Curt's 9th Painting Challenge. I had hoped to add a few more units during the challenge but work and illness dashed those plans right at the tail end. For heavy support I painted a squadron of Leman Russ Battle Tanks and for transport an Arvus Lighter. The Forgeworld model for the lighter is far too expensive for what it is and looks like a Star Trek shuttle craft. I wasn't interested in it, so I picked up a much cooler model from Mantic Games to represent the Arvus. My only complaint with the Mantic model is they went with the tiltrotor for propulsion. I guess it doesn't fly through space. The Hornet from Mantic Games. It will be used as an Arvus Lighter. The troop compartment opens, but I was lazy and didn't bother with painting it. Some more fantasy painting to post today - a vintage Citadel Horned Dragon picked up recently on eBay. The MDF base was supplied by Conscript Byron's Northern Lights Terrain - cheers Byron! Just look at the character in that face! This model was sculpted by Nick Bibby, my favorite dragon sculptor of the vintage era. In case you're wondering what he's up to nowadays, I can tell you that Mr. Bibby is a prolific fine art sculptor. He's created some amazing pieces, including a series of sculptures of England's champion animals (blackface sheep, shire horses, Angus bulls and the like) and an amazing 15-ft tall Kodiak bear commissioned by Brown University. Bibby's bronzes sell for thousands of pounds nowadays, which makes the $40 or so I had to give for this wonderful vintage dragon seem something of a relative bargain. For those who aren't familiar with the Horned Dragon, here's a couple pics with human-sized models to give a better idea of scale. Above, the knight from the Citadel Adventurers box I painted recently. Here's the Dragon with an Otherworld adventurer. Wow - you could nearly drive a truck through those gaps! I ended up pinning the two halves of the body together, but the rest of the parts are held just with superglue and greenstuff (fingers crossed). I used a new primer on this model - Rustoleum Painter's Touch "2X Ultra Cover Paint and Primer". Well, I can say that it does what it says on the tin. It was shocking how well the paint covered with just one pass. Recommended. Lastly, here are some models I pulled out and painted on Saturday afternoon - these are the Forge World "Apostate Preachers of Nurgle" that I've had in my "to paint" Plano case for a year or two. Whilst browsing TMP on Friday I saw someone's excellent work on these models posted on coolminiornot, and decided to just get off my arse and paint mine. Pretty straightforward paintjobs, these - mostly Catachan Green/Death World Forest highlighted a bit with a lighter mix of DWF, and washed with Agrax Earthshade. I think they turned out fine for a couple hours' work and they'll fit in well with the Renegades. It's great to get back into the fantasy painting thing after taking a bit of a break. The impetus is a new game that's just come out - Rangers of Shadow Deep. This is a cooperative tabletop miniatures game that's essentially "role-playing lite." And since I've been trying to work up my nerve to run an RPG game for some friends who are anxious to try it, I thought that Rangers would be a great way to get back into the DM mindset. ANYWAY... first up on the painting desk was this amazing set of Citadel Adventurers. I found the box on eBay from a seller in Vancouver, complete except for the "stout Dwarf warrior." Said Dwarf warrior was duly procured from an eBayer in the UK, and I set about painting the set. This fighter was really the model that sold me on this set. I just love this figure! While I painted most of the models in the colours shown on the box illustration, I already have a bunch of blue-and-yellow liveried fighters, so I opted for red and white. The gryphon decals are from a sheet I got for my Howling Griffons. How's this for a magic user? Just a great sculpt, down to the snake-headed staff. What's an adventuring party without gnome fighter? Nothing, that's what. One class of PC that's often hard to find a model for is the good old reliable cleric. Citadel's come through nicely here with a southpaw clergyperson wielding an unfeasibly large war club. Lastly we have the Dwarf thief, another great figure. Each blister of three spiders came with a "victims" piece which is pretty cool also.